Okay, so technically it’s an observation wheel, not a ferris wheel. Use our High Roller coupon for a $5 discount on adult tickets for rides after dark. Just click on your friend Coupon Puppet below to get this deal! Ever seen pictures of The London Eye? That super cool gigantic ferris wheel on the banks of the River Thames in England, with huge passenger pods and great views? Well, now you don’t have to cross the pond to experience such delights! Las Vegas has its very own observation wheel called the High Roller, and it is even taller than the London Eye (550 feet versus 443 feet, for those keeping score at home). 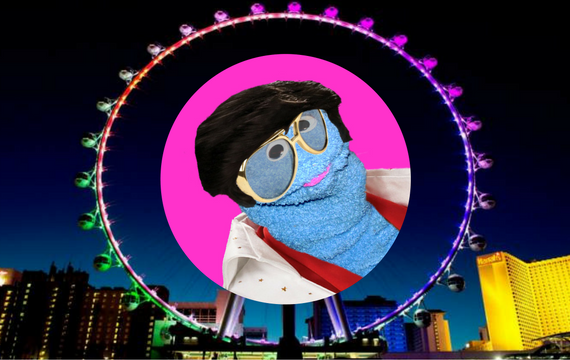 The High Roller is part of the relatively new LINQ entertainment complex, which is full of restaurants and bowling alleys and music venues and a Sprinkles cupcake ATM that Coupon Puppet may or may not have visited at three in the morning. The LINQ is located smack dab center Strip, right next to Harrah’s and across the street from the Forum Shops at Caesars. The High Roller has different admission prices for daytime versus nighttime rides. Let’s face it, we all want to go at night, right? To see the sparkling Strip in all its glory? Our High Roller coupon from BestOfVegas saves you $5 on adult tickets for night rides. You can also save $2 on kid tickets. Kids are not welcome in the Happy Hour car, by the way. Or should we say Happy Half Hour? You can purchase tickets for the Happy Hour car with its open bar, but please note the wheel takes exactly thirty minutes to go around. So you’re gonna have to drink fast to get your money’s worth! Something Coupon Puppet cannot fully recommend, as you are already on a vertigo-inducing glass pod travelling through the sky. Have A Great Ride & Save Money With A High Roller Coupon From Coupon Puppet!